LA Premiere June 19 at 7:30 p.m.
TV Broadcast Premiere June 27, at 8 p.m. 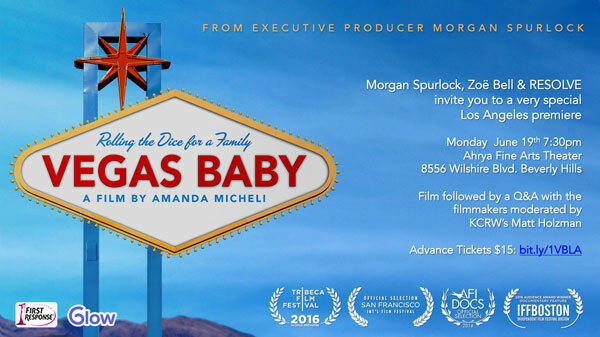 Directed by Oscar® nominated filmmaker Amanda Micheli and executive produced by Oscar® nominated Morgan Spurlock, "VEGAS BABY" pulls back the curtain on the world of reproductive medicine through a provocative, “truth is stranger than fiction” premise. The film follows aspiring parents from all walks of life who place themselves in the hands of a Las Vegas doctor and his annual contest, which offers the prize of a free round of IVF – with no guarantee of success. Contestants post video entries online telling their stories, counting on the votes of strangers to help them realize their dream of becoming parents. Despite the fact that 1 in 6 couples worldwide struggle with infertility, for fear of judgment or heartache or both, would-be parents tend to keep their infertility stories secret. "VEGAS BABY" breaks the silence around this often misunderstood medical and social issue, and through her intimate lens, Micheli explores universal themes of desire and loss.